The video uses the Republican presidential front-runner as a recruiting tool. Segments of an interview that Donald Trump gave to the “Today Show” have been used in a video released by a pro-[ISIL] media group that praises the recent Brussels attacks in which 31 were killed and 270 injured. 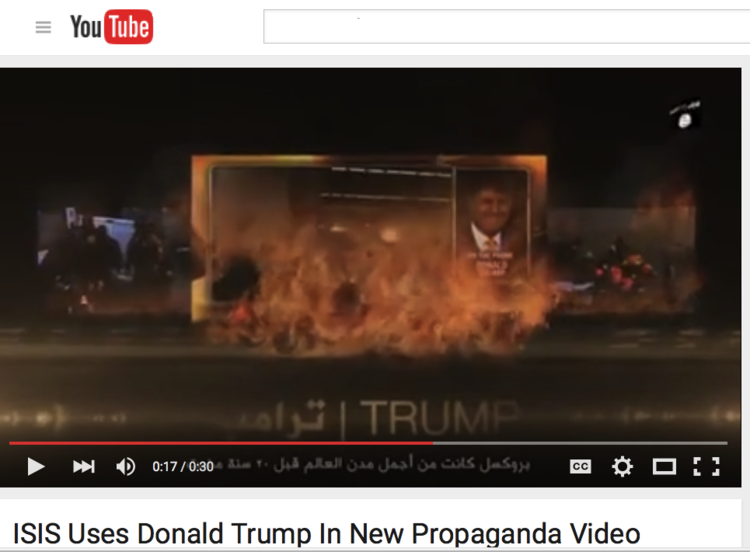 The nine-minute video titled “The Exile of Islam and Brussels Attacks” was released by the Al-Battar Media Foundation, and shows the Republican presidential hopeful’s photo in flames while playing the interview clips. “Brussels was one of the great cities, one of the most beautiful cities of the world 20 years ago, and safe and now it’s a horror show, an absolute horror show,” he is heard saying. The video also has footage taken at Brussels Airport and Maalbeek Metro station after this week’s suicide blasts. “The crusade jets including the Belgian are still bombing the Muslims in Iraq and Levant in the day and the night, killing children, women, old, and destroying mosques and schools,” a speaker says in Arabic. Belgium is a member of the U.S.-led anti-[ISIL] coalition, that since since September 2014 has conducted several airstrikes without any authorization from a government or the United Nations.